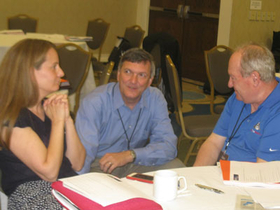 Mike Wischhusen (center), technical director-litigation for Michelin North America Inc. talks with Tracey Norberg (left), senior vice president and corporate counsel for the Rubber Manufacturers Association; and Glenn Maidment, president of the Rubber Association of Canada. HILTON HEAD, S.C.—Smart tire manufacturers will learn as much about legislative and regulatory processes as they can, get to know the legislators and agency officials with authority over them, and participate as much as possible in the crafting of legislation and regulations that affect their industry. That was the message that Michael Wischhusen, technical director-litigation for Michelin North America Inc., had for attendees of the 30th annual Clemson University Tire Industry Conference in Hilton Head. “It's not like we're a drug maker, but we're a regulated industry, and it affects what we do and how we do it,” Wischhusen said as leader of a pre-conference workshop April 23. “This is not necessarily a topic I love, but it's one we've got to deal with, because regulations are part of our lives. The events leading up to the Transportation Recall Enhancement, Accountability and Documentation Act were a lesson few tire or auto industry executives could ever forget, Wischhusen said. But the recent General Motors recall of millions of vehicles, tied with the news that GM officials ignored the ignition switch problem for years while 13 motorists were killed, means the industry is in for yet another hard time on the regulatory front, he said. The biggest problem with the TREAD Act—likely to be the biggest problem with any legislation or regulation arising from the GM recall—was submission of data, according to Wischhusen. Much of the information the tire industry submits to the National Highway Traffic Safety Administration is not made public, because it reflects too strongly on competitive issues within the industry, Wischhusen said. Warranty returns and common green tire data top this list, he said. However, consumer advocates and trial attorneys always will clamor to have all defect and recall data made public, and any regulations based on the GM recall will give them another opportunity to do so, Wischhusen said. Furthermore, the TREAD Act and other safety regulations are just the tip of the regulatory iceberg, according to Wischhusen. Tire manufacturers also have to pay close attention to the Toxic Substances Control Act from the Environmental Protection Agency; the Regulation on Regulation, Evaluation, Authorization and Restriction of Chemicals from the European Union; and various state and local laws involving the collection, processing and use of scrap tires, he said. • Follow up on your actions. Initiating rulemaking, or even making persuasive comments on rulemaking, is not a simple process, Wischhusen said. Industry professionals should learn to anticipate the reactions of other stakeholders to their proposals and to form a Plan B if possible, Wischhusen said. One of the most important things tire executives can do to understand the scope and process of federal regulation is to look at the Federal Register as often as they can, according to Wischhusen. Tire executives need to remember that the agencies they deal with are stakeholders in their own rulemaking, Wischhusen said. “They have their own agendas, and they're not just there to do what we tell them to do,” he said. “It is important to understand that anything you propose is going to impact others, and they are going to weigh in. They may be with you or against you; they may have goals that are diametrically opposed to yours.